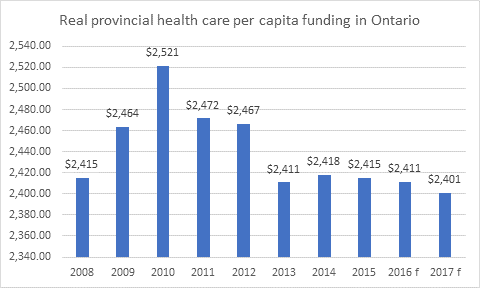 Real provincial government health care funding per-person has fallen again this year in Ontario, the third year in a row. Since 2009 real funding per-person has fallen 2.6% -- $63 per person. Across Canada real per person funding is in its fourth consecutive year of increase. Since 2009, real provincial funding across Canada is up $89 -- 3.6%. 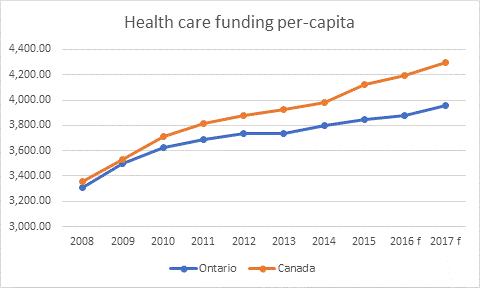 In fact the funding gap between Ontario and Canada as a whole has gown consistently for years (as set out below in current dollars). Ontario funds health care less than any other province -- indeed, the province that funds health care the second least (B.C.) provides $185 more per person per year, 4.7% more. 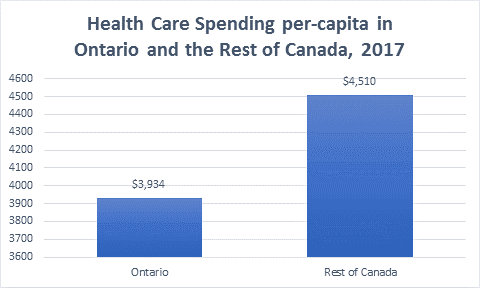 Provincial health care spending in the rest of Canada (excluding Ontario) is now $574 higher per person annually than in Ontario. 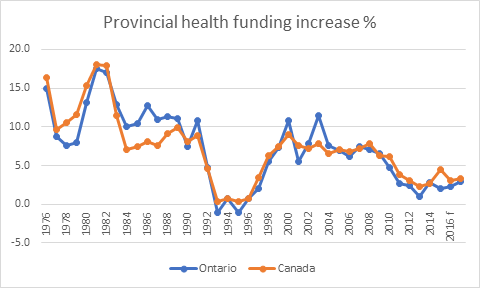 Ontario has not always provided lower than average health care funding increases-- but that has been the general pattern since 2005. Private expenditures on health care have exceeded Ontario government increases for the last three years. 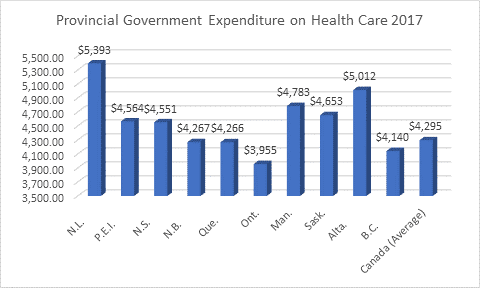 Since 2011, private expenditures on health have increased 3.9% annually, while provincial expenditures increased 2.3% annually. 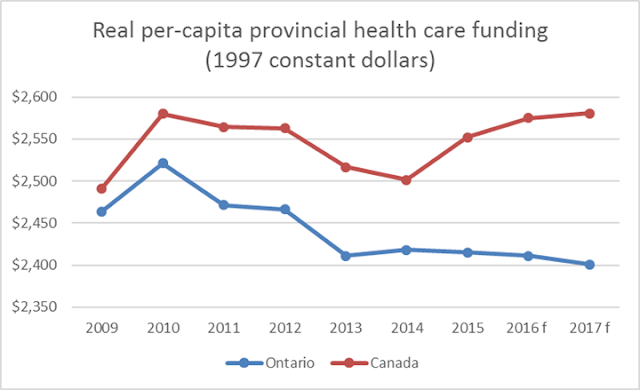 Starting in 2010, provincial government health care funding increases in Ontario began to fall, hitting just 1% in 2012. 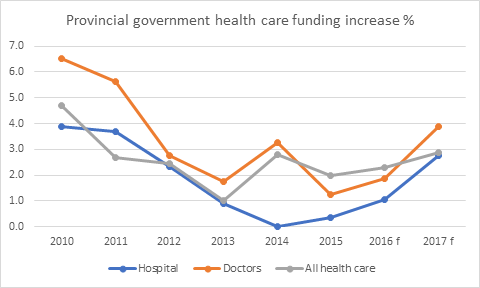 Hospital funding increases continued downward in 2013 hitting just above 0% in 2013, recovering somewhat in 2014 and 2015. Funding increases for doctors were quite a bit higher, despite the alleged attack on their incomes. 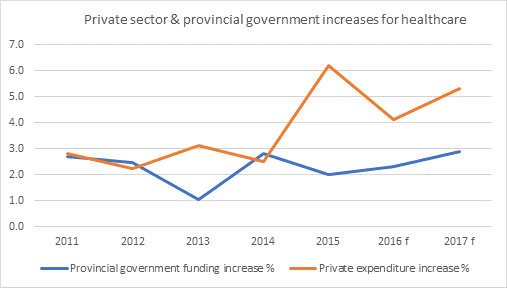 Below is a chart with the provincial government per person dollar funding since 2008 in real dollars (using constant 1997 dollars). In 2017, real funding per person was still less than in 2008 -- although the Ontario economy is about 17% larger than it was in 2008. The hysteria from the right about runaway health care cost is just that -- hysteria. Two-thirds of this dollar cut came from cuts to hospital funding. 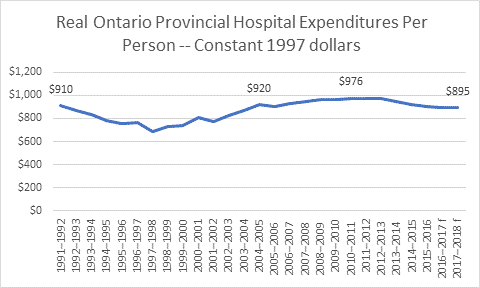 Since 2010/11 real provincial hospital expenditures have been cut 8.3%. That is $81 per person per year in constant 1997 dollars, or $128 per person in today's money. In fact real provincial expenditures on hospitals are lower than they were in 1991 -- despite an increase in the median age in Ontario from 33.3 years to 40.6 years and a doubling of the population over 65 (and even bigger increases in the population over 85). 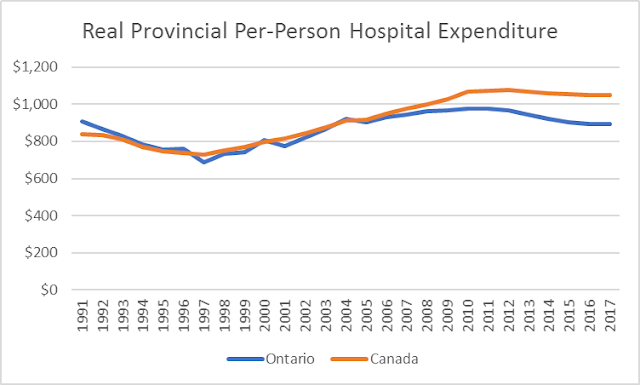 In 1991, Ontario spent more per-person on hospitals than Canadian provinces and territories as a whole, but now Ontario falls far behind. The provincial government has promised a 4.5% health care funding increase for 2018/19. That should result in at least a one-year real per-person funding increase for 2018. But it is not enough to reverse the decline of recent years. Worse, the government also quietly notes that it will revert to a lower increase in 2019/20 -- once the provincial election is over. See https://www.cihi.ca/en/national-health-expenditure-trends#data-tables for all CIHI National Health Expenditure Trends 1975-2017 published data. With the election over, pressure to cut public programs has become quite intense. In almost all of the corporate owned media someone is barking on about it. Another option -- increasing revenue from corporations and the wealthy is not mentioned. However, data clearly indicates that Ontario does not have an overspending problem compared to the other provinces. Instead, it indicates Ontario has very low revenue. Ontario has the lowest public spending of all the provinces on a per capita basis (see the chart from the 2014 Ontario Budget below). So there is little reason to suspect that we have an over-spending problem. If anything, this suggests we have an under-spending problem. The new Progressive Conservative government in Ontario has promised 30,000 new long-term care beds over the next ten years, often connecting this to their promise to end hospital hallway medicine. But how does this promise stack up with growing demand for these facilities? Most people 85 and older live in collective dwellings (LTC facilities, seniors residences, multiple level of care facilities). The setting with the largest number of elders 85 and older is LTC facilities, with about 35% of the population 85 to 89 years old and almost 40% of the population 90 to 94 years. Older people are even more likely to be in a LTC facility. The population 85 and older is the main driver of the need for long-term care beds. Has the Financial Accountability Office over-estimated the deficit once again? Buried in this week's Financial Accountability Office (FAO) report on the Ontario government books is a very quiet admission that Ontario ran a surplus of $700 million in 2017/18 (when using the government's accounting method for pension surpluses and hydro). Just a year ago, the FAO claimed there would be a deficit of $500 million. This $1.2 billion over-estimate is not surprising. The FAO has consistently cried wolf. A year ago, they put the 2016/17 deficit at $2.8 billion (when using the government's accounting methods). Now they put it at $1 billion with the same accounting methods. Towards the end of the 2015/16 fiscal year they overestimated the deficit for that year by $3.3 billion to $5 billion more than they subsequently admitted. Even after that fiscal year ended, they put it at $2.2 billion more than they later admitted.